Melbourne emphatically proved its premiership credentials in Alice Springs on Sunday in a 91-point hammering of Adelaide. The Demons racked up their fifth consecutive win with the 23.8 (146) to 8.7 (55) victory over last season's beaten grand finalists. For the Crows, the drubbing was their heaviest defeat under coach Don Pyke. The Dees got off to a flyer, kicking the first five goals of the match. The signs were bad early for Adelaide when the fourth goal, before the 10-minute mark, involved four Melbourne players handballing to each other with barely a Crow in sight. 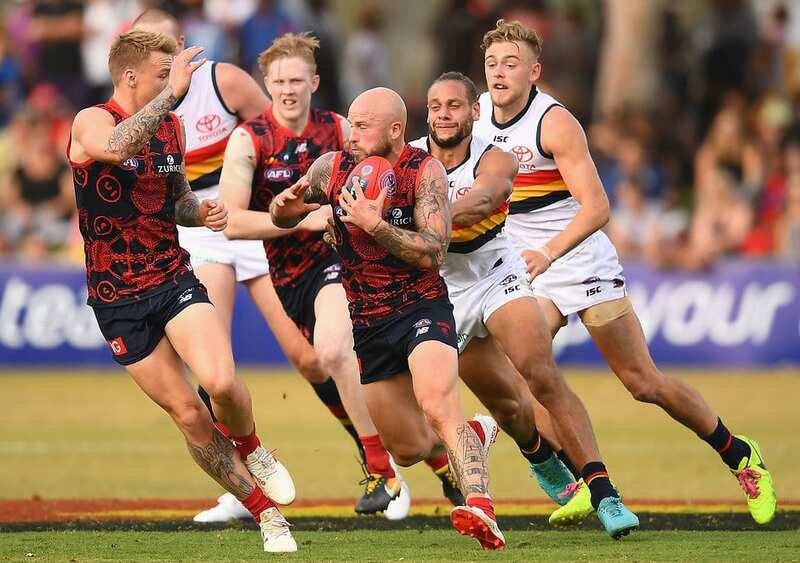 Eddie Betts notched Adelaide's first goal with a 50-metre kick that brought the strongly pro-Adelaide crowd of nearly 7000 at Alice Springs's Traeger Park to life, despite it being the Demons' home match. The Crows kicked three out of the next four goals but Melbourne steadied with two more to lead by four goals at quarter-time. Crows fans' hopes for a better start in the second quarter were dashed when Demon Tim Smith scored just 50 seconds in. The match looked over when Charlie Spargo kicked a goal halfway through the third quarter taking Melbourne's lead to 53 points. The Demons were winning out of the centre, with Max Gawn beating Sam Jacobs to get first use of the ball for a tough on-ball brigade including Jack Viney, Nathan Jones and James Harmes and Jesse Hogan kicking five goals. Melbourne: Neville Jetta was involved in a first-quarter head clash with Jake Lever, but returned to play out the match. Adelaide: Paul Seedsman suffered another adductor injury – a problem that twice set him back last year – in the warm-up and was a late withdrawal. Luke Brown didn't play after quarter-time because of concussion. Melbourne will try to make it six wins on the trot when it faces the Western Bulldogs at Etihad Stadium on Saturday afternoon. The Crows are back in the familiar surrounds of Adelaide Oval on Sunday, hosting a Greater Western Sydney side in desperate need of a win.